Were you looking for Diablo 2 waypoints? Diablo 3 Beta Waypoints menu. Waypoints are special plates on the ground that form a network of jump points allowing players to instantly teleport between. The first one is in New Tristram, Act 1, and the next is located in Old Ruins Old Tristram and will be available to jump to once the player has reached it. Waypoints are often located at checkpoints, so a character resurrecting after death, or joining a game to continue a quest, may appear near the waypoint. Simply click on a waypoint to move to it. Once your character is standing there, the waypoint interface opens up, with a menu showing all available waypoints. Clicking one of those will instantly teleport your character and minions to the selected location. There is no casting cost, cooldown, and the travel is instantaneous, making waypoints a faster way to return to town than town portal which has a casting time. Not every waypoint is displayed at all times. Unlike the Diablo II system, where there were just eight waypoints per act, all of which were available once a player had discovered them, there are dozens of waypoints per act in Diablo III. While waypoints must be reached through dungeon exploration to activate and add to the display list, not all waypoints are always available. Even for a player who has already completed an area. For instance, a player starting the fourth quest in the Diablo III Beta could only travel to the Cathedral Garden waypoint. From there the player descends to Cathedral level 2, which has no waypoint. Cathedral level 3 does have a waypoint though, and once a player reaches it that waypoint is added to the display. Further exploration takes the player down through Cathedral level 4, and then to the Royal Crypts, where the last waypoint of that quest is found. 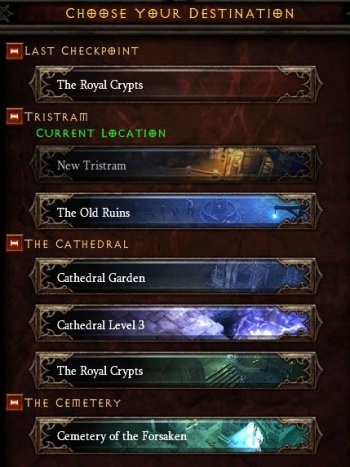 Players can travel freely between any of these waypoints and Tristram once they are located, but players can not simply jump down to the Royal Crypts upon creating a new game. This is an intentional feature, as it prevents players from exploiting the waypoint and quest system to quickly "run" bosses and obtain better drops and the large experience and gold rewards from completing quests. Blizzard explained the game logic behind a character "forgetting" a waypoint from one game to the next in a forum post from April 2012. One way to think of it is that waypoints are not something your character remembers from game to game, they're discovered in each game based on your progression through the story. When you choose a previous quest it's like beginning a new game at that quest. If you want to jump to a later point you need to make or join a game that begins at that point. Every large area in the game has a waypoint in it, and most dungeons do as well, if the player must move through them on a quest or normal game progression. Smaller sub-dungeons and levels generally do not have waypoints in them, just portal stones at the end of the dungeon to allow a quick return to the entrance. Only those seen in the beta and the "over the fence" bonus content are known. Dozens more will be encountered later in the act. A couple of Waypoints early in the game. No waypoints in Acts Two, Three, or Four have yet been confirmed. Waypoints are part of a network of teleportation nodes created by the Horadrim during the Sin War to provide instant travel from one place to another. The reason why this was so crucially necessary was that they did not know where the demons could appear next and it was essential that they could swiftly combat the forces of Darkness, even when the attack was located in an outlying region with a considerable distance from a town or settlement harbouring Horadrim mages. The network is built up from runed stones infused with magical power of enough strength to teleport a user to another similar stone. The traveler must physically stand on the stone to use its power. The knowledge to create new waypoints has since been lost, but some of these magical rocks can still be accessed and used, if you happen to find one. They remain as a legacy to the Horadrim's once-great power and the value of these devices cannot be denied. This page was last edited on 11 November 2013, at 07:41.